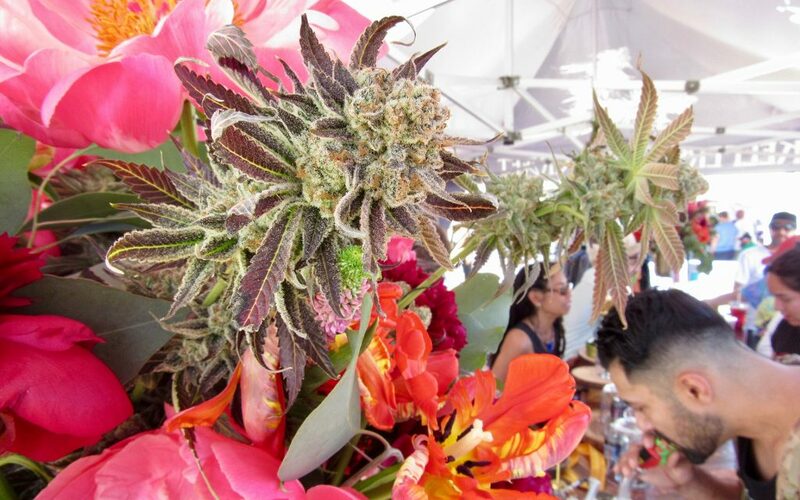 Wander into the city block-sized cannabis Coachella in California’s Wine Country last weekend, and you would have experienced a Matrix-like reality shift. ‘WHAT IF I TOLD YOU, THIS WHOLE PLACE IS A 215 AREA,’ The Matrix’s Morpheus suddenly cuts in. And you realize how far down the rabbit hole we’ve come. And smile. Keep your eye on California this year. It’s the only place in world history with fully licensed, recreational public cannabis consumption. 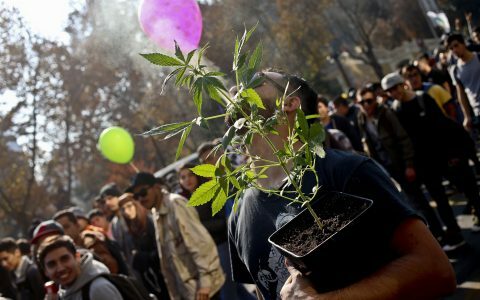 Nine US states and Uruguay have all legalized cannabis. Other locales allow medical or have decriminalized it. 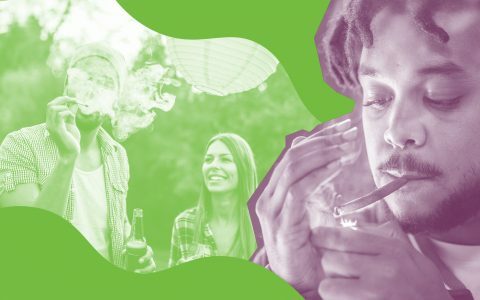 But as far as we know, no place on Earth or in history — until California — has licensed the most elemental of cannabis activities: the public smoke-out. 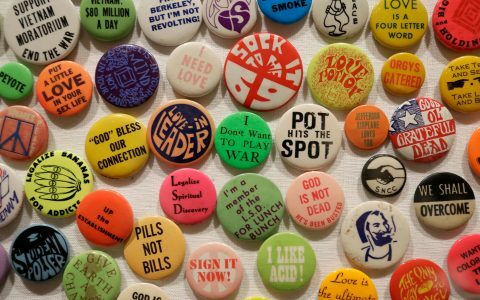 Yes, unsanctioned smoke-outs have been a part of cannabis activism since at least the ’60s. 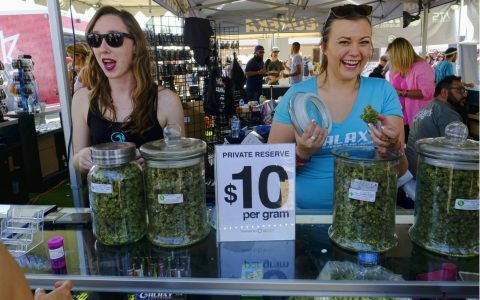 But this summer, the state of California and two different cities — Santa Rosa and Sacramento — have issued state and local event licenses allowing the purchase and use of recreational cannabis by adults. California has beat Colorado, Washington, Oregon, and everyone else to this simple pleasure. We got our groove back. 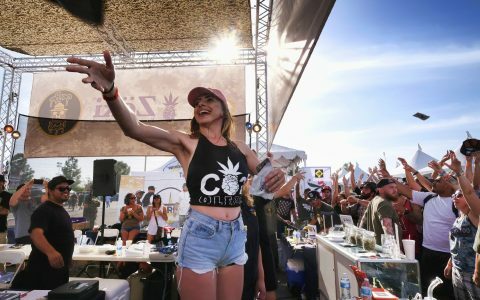 At the end of last weekend, Jon Cappetta, spokesperson for event promoter High Times, pronounced the Santa Rosa Cannabis Cup a success. “This was a safe and wonderful event for all,” he said. The venerable magazine began throwing unlicensed cannabis contests and parties — Cannabis Cups — in Amsterdam in 1988. Last weekend was the manifestation of a decades-old vision of adults freely associating around their shared hobby, Cappetta said. “We hope it serves as a model for other states and locales who are still trying to figure these communal gatherings out,” he said. Dozens of California brands competed for first, second and third place trophies in 19 categories — from Best Hybrid Flower, all the way down to Best CBD Concentrate. 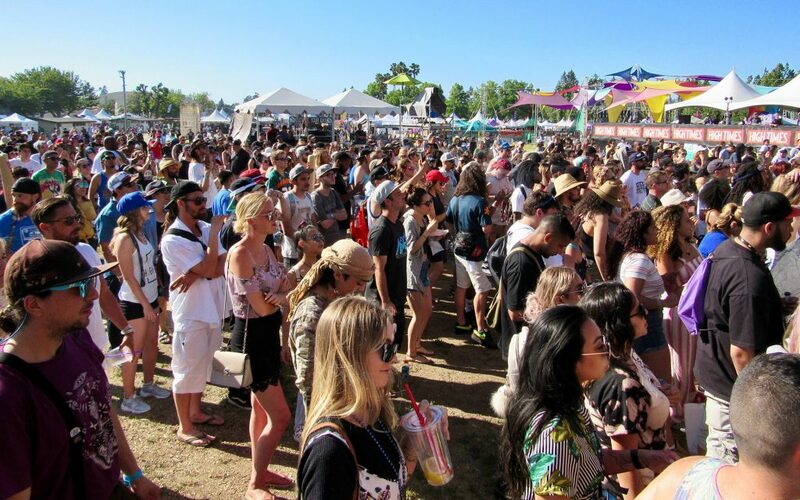 Multiple thousands of attendees paid $50 a day for the festivities, which included dozens of booths where you could buy the world’s best herb, extracts and seeds from Alien Labs, C.R.A.F.T., GoldDrop, The Village, Connected Cannabis Co., Dying Breed and Crockett. 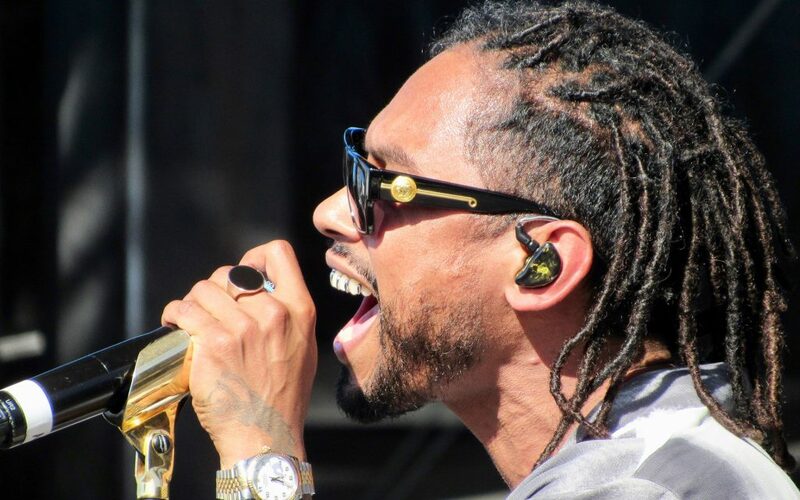 Musical headliners Phil Lesh & Friends braved the searing, 90-degree Sonoma County heat Saturday, while young crooner Miguel opened for Blues Traveler on Sunday. Coachella vibes prevailed with women in strappy sandals and dresses accompanying basketball and skater bros in cargo shorts and ball caps. Slushies, shave ice, frescos and ice cream sold at brisk premiums alongside $40 half-ounces of sun-grown Gelato #41 and $60 eighth-ounces of Mimosa V6 from The Village. “I like that it seems more adult and we’re not sectioned off in a 215 area. 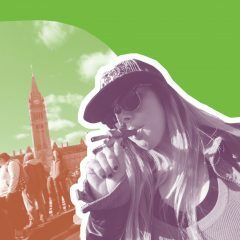 I was looking for a place to go to smoke,” said attendee and cannabis entrepreneur Elise McRoberts. Sonoma County is a cradle of modern cannabis civilization, with taps on the culture of Mendocino and Humboldt counties just hours up Highway 101. Nowadays, it’s cannabis’ Silicon Valley, with a better business climate than maybe anywhere else on Earth. “It’s a pleasure to be here where all this spread out from,” said High Times’ Danny Danko. Pulling off a recreational Cannabis Cup with legal consumption has stymied High Times before. Their Colorado Cannabis Cup ended in tears in 2016 after local municipalities denied permits to the event. 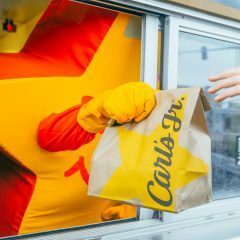 High Times also failed to deliver the goods in San Bernardino on 4/20 this year. Local leaders vetoed consumption and sales just days before the gates opened. High Times kept pushing the envelope, though. California is the only state to explicitly legalize recreational cannabis events through Proposition 64. 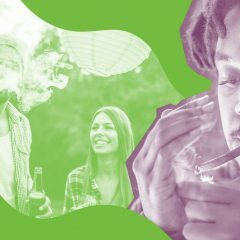 “It is unique to California, and it’s definitely where we’re going to see social use of cannabis,” said Figueroa. But actually throwing a cannabis party costs thousands of dollars for a state cannabis events promoter license and event permit, plus finding a friendly county fairground, in a friendly city. 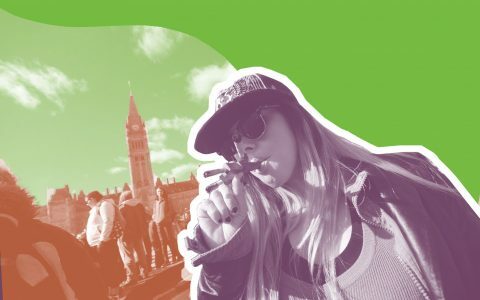 Since Jan. 1, there have been just two recreational sales and smoke parties — for a state of 38 million people and tens of millions of visitors. “The process is only getting easier the more often we produce them, and the more successful and economically beneficial examples we have to point back to,” Cappetta said. The NorCal Cup certainly has some kinks to iron out. Heat and dehydration sent several attendees to the medical tent for rest and fluids. 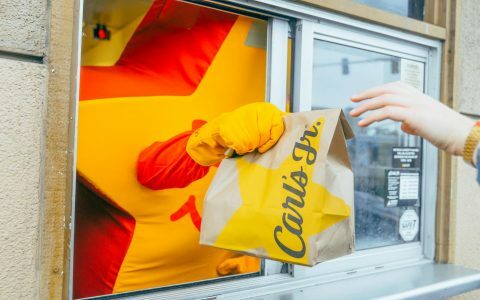 On Saturday, the Santa Rosa Police Department shut down the booth of local delivery service Louie’s Gouie for selling seven, one-pound bags of cannabis without a license. The personal recreational limit for adults 21+ is one ounce. The biggest downside was out of anyone’s control — the punishing 90-degree sun. Attendees wilted trying to watch the live acts and listen to the awards ceremony Sunday at midday. One easy fix: At the Cup, alcohol drinkers were relegated to the edge of the property, hidden from view in an ethanol-only zone. … Ah, delicious irony. David Downs is the California bureau chief for Leafly News. He writes a weekly column on trending California news and lifestyle. Email him at david.downs@leafly.com. Follow him on Twitter, Facebook, and Instagram.